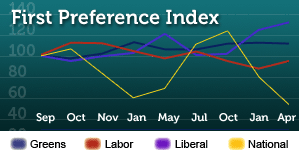 According to our polling, which we have just posted today Gladys Berejiklian is in the paradoxical position of being ahead on most indicators, but behind on the two-party preferred vote. Retirement income and savings policies could be deciding factors in this coming federal election. That is one of the conclusions of our latest What the people want, polling report. Download the report by clicking here. Since the previous qualitative poll completed by the Australian Institute for Progress 12 months ago, the Coalition has improved in just about every ­aspect, apart from its vote against the ALP. That suggests its vote will eventually improve as well. The issues have also moved around in a direction that favours the Coalition. We have just analysed our longitudinal research during the Victorian election comparing a sample taken midway through the campaign with one on the weekend of the election, just after respondents had voted. We conducted qualitative polling of voters in the Victorian election last week. The full report can be downloaded by clicking here. Best that has happened to WA, a return of an ALP Government & we need to win again in QLD.